Gabriel Bouys, AFP/Getty ImagesBill Gates, Microsoft co-founder and co-chair of the Bill & Melinda Gates Foundation. $650 million is a lot of money -- even for Bill Gates. That's how much his investment firm has invested in what might be considered the best way to play China. It's not a software firm or even a computer hardware firm. It's mining giant Caterpillar (CAT). Gates started building a position in Caterpillar before the financial crisis, but he became a very aggressive buyer once the crisis hit and shares had fallen by half. Yet remarkably, Gates has kept on buying, even as shares steadily rebounded to previous peaks. But now that Caterpillar has come under pressure on concerns that China is slowing, is Gates locking in profits? No, he's been buying more, picking up another 500,000 shares in this year's second quarter. At current prices, his firm's stake of 10.76 million shares is worth a cool $650 million. The key question: Why does Gates continue to buy shares even after China's slowdown has signaled the potential end of a global commodities boom? After all, much of Caterpillar's growth in recent years has come from a strong surge in mining activity that uses the company's massive excavators. The simple answer is that Gates and his team of investment managers always focus on long-term winners and never buy or sell shares based on short-term economic shifts. We've seen him do it many times before. For example, even as Wall Street analysts focused on the near-term prospects for auto retailer AutoNation (AN), Gates saw an epic rebound coming, as I noted in this article. Shares of AutoNation have now risen 400 percent since early 2009. The company sees only a few competitors that are capable of making the massive equipment needed to dig huge holes in the earth. Fewer competitors means firm pricing. In 2012, Caterpillar had 27 percent gross margins and 18 percent margins on earnings before interest, taxes, depreciation and amortization, or EBITDA. In contrast, automakers, which operate in a much more competitive industry, rarely exceed 15 percent gross margins and 10 percent EBITDA margins. Caterpillar is aggressively accelerating its product development spending. Capital expenditures rose to $3.5 billion last year, handily exceeding the $2.5 billion in average annual spending over the past three years. Rising capital expenditures tend to lead to a stronger competitive hand down the road. Caterpillar's cash flow is so robust that its dividend was hiked at a double-digit pace in 2012 and again in 2013, even as the company is in the midst of a $7.5 billion. Meanwhile, a traditional view from Wall Street analysts paints a very different picture. Caterpillar's profits are likely to fall around 30 percent this year (to around $6.30 a share), and are unlikely to rebound to the peak per-share earnings of $8.90 a share seen last year until 2015. The company's $65 billion in annual sales last year are also a peak that won't likely be seen again before 2015. Merrill Lynch, which has a "neutral" rating for the stock, best sums up the Wall Street view: "CAT is very well positioned for the long term, but the slower earnings trajectory that we foresee in coming years due to fading momentum in mining equipment demand and a softer construction equipment outlook will likely limit the stock's multiple expansion potential." While these analysts see a company being challenged by weak near-term growth prospects in its end markets, it's important to think about this stock in a long-term context. For example, Merrill Lynch cites a tepid outlook for construction equipment, yet the U.S. and Europe, which collectively account for half of global economic activity, have had depressed construction markets for half a decade. If anything, the pace of non-residential construction may accelerate in 2014 and 2015 as these lumbering developed economies finally make up for lost time in terms of capital investments, as I noted in August. And has the China-led supercycle in commodities really come to an end? Perhaps not. The Chinese economy is now showing signs of a tentative rebound. And the leading emerging economies, such as Brazil, Turkey and India, also still have huge investments to make in their infrastructure to support their future growth. So while Merrill Lynch and other research firms quibble over near-term earnings multiples, Bill Gates likely sees Caterpillar as a company whose best days are yet to come. Risks to Consider: Caterpillar's shares often trade in sync with sentiment regarding Chinese economic growth, so any fresh concerns about the Chinese economy are likely to pressure shares. 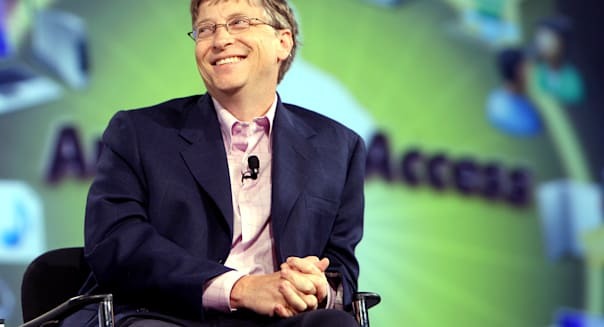 Action To Take: Bill Gates has shown little inclination for "timely" investments. Instead, he focuses on companies with robust long-term moats around their business. He uses share price pullbacks on great companies like Caterpillar to deepen his commitment. That's a move he likely learned from his close friend Warren Buffett, and an important example to follow whenever the market chatter gets noisy around a particular company or industry. David Sterman doesn't personally hold positions in any securities mentioned in this article. StreetAuthority LLC doesn't hold positions in any securities mentioned in this article.